Join the WatchTravaganza Raffle Promo! For every watch purchased from November 8 to 11, 2017, get a chance to win a Samsung J1 Smart Phone! 1.) From November 8 to 11, 2017, every watch purchased online through the UniSilver TIME website (www.unisilvertime.com) entitles a customer to 1 raffle entry to win a Samsung J1 smart phone. 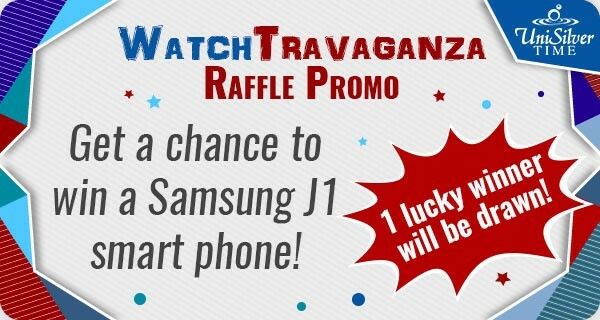 1 Samsung J1 smart phone will be raffled. 2.) The purchase must be fully paid before December 1, 2017 to be considered valid. 3.) Drawing of the raffle winner will be done by electronic means on December 1, 2017 at 3:00pm at the head office of Chronotron, Inc. 4.) The winner's name will be posted on UniSilver TIME's website and Facebook fan page www.facebook.com/wwwunisilvertimecom on December 2, 2017. 5.) The winner will be notified on how to claim the prize. 6.) Metro Manila winner must claim the prize at UniSilver TIME's head office at the mezzanine, Goiti Bldg., #15 Muelle de Banco St., Plaza Lacson, Sta. Cruz, Manila. Provincial winner can claim the prize at any UniSilver TIME branch nearby. 7.) To claim the prize, the winner must present a valid ID (Company ID, School ID, SSS ID, Comelec ID, Postal ID, Senior Citizen's ID, Passport, or NBI / Police Clearance). 8.) The prize is not transferable and not convertible to cash. 9.) Unclaimed prize after 60 days from receipt of notification will be forfeited. 10.) Employees of Chronotron, Inc. including their relatives up to the second degree of consanguinity or affinity are disqualified from joining this promo.